Each year, on September 12th, Our Lady of the Lake Parish commemorates our parish feast day, The Most Holy Name of Mary. Festivities begin at 5:30pm at Arcadia Beach Club with a hot dog cookout. After, everyone gathers on the beach where Fr. Joe and members of the music ministry begin leading us in prayer. 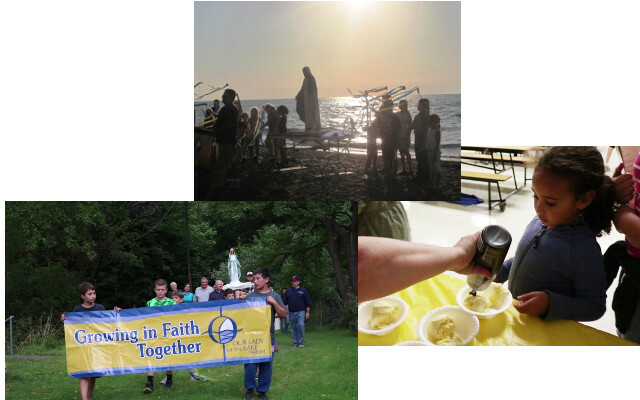 We pray, sing, wave streamers and process carrying Mary from Arcadia, up East 201, around the corner onto Lake Shore Blvd. and into our church placing Mary in front of the altar. When our prayer service concludes, everyone is invited down to our parish hall for more fellowship and an ice cream social. Please mark your calendar for September 12th and join us for this exciting celebration.